Saddam Hussein should be held for trial even though most Iraqi prisoners of war are entitled to immediate release at the end of the U.S. occupation of Iraq, the Red Cross said Monday. "Any prisoner of war suspected of having committed any type of crime can be charged and tried," said Antonella Notari, chief spokeswoman of the International Committee of the Red Cross. Notari said she wanted to make clear the neutral ICRC has no desire to see the release of any POWs, including Saddam, who are suspected of criminal acts. "Nobody in the ICRC is calling for the release of Saddam Hussein. Absolutely not," Notari told The Associated Press from the Geneva headquarters of the humanitarian agency, which serves as a watchdog to ensure adherence to the Geneva Conventions on the conduct of warfare. Earlier Monday the Baghdad-based ICRC spokeswoman, Nada Doumani, told Associated Press Television News that under international and military law, Saddam and other prisoners of war and civilian prisoners should be released at the end of the conflict and occupation unless there were charges against them. Notari said the ICRC was unable to speculate on what would happen July 1 because it didn't know how the United States would proceed with the handover of sovereignty. "We're not making any ultimatums or calls for release," Notari said. "What we're saying is: Saddam Hussein, as far as we understand today, is a POW, prisoner of war, protected by the third Geneva Convention as all prisoners of war are. But that assumes they were just interned because they were combatants participating in a war. American forces say that as many as 1,400 detainees will either be released or transferred to Iraqi authorities by the June 30 handover of power. The Americans will continue to hold between 4,000 and 5,000 prisoners deemed a threat to the coalition, the military said. Although Iraqis will run their own affairs after June 30, tens of thousands of coalition troops will remain in the country to maintain security under a resolution approved unanimously last week by the U.N. Security Council. After the handover of sovereignty, detainees held by the Iraqi authorities will be subject to Iraqi law. "Now, of course, a prisoner of war who is suspected of having committed a crime must not just be released," Notari said. "Of course, he must be prosecuted, tried, through a legal proceeding. 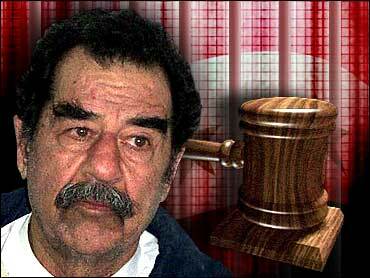 She said it was up to U.S. authorities to decide what they will do about Saddam. "If they continue to hold him at some stage they will have to charge him," Notari said. "They can also hand him over to the Iraqis, who can charge him and try him." Iraq's interim prime minister, Iyad Allawi, told Al-Jazeera television Monday that he received official confirmation that all detainees, including Saddam, would be "handed over to the Iraqi government" within two weeks.